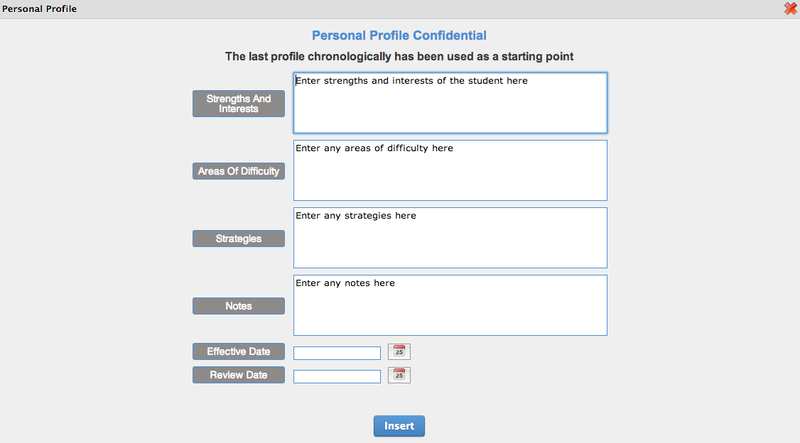 This area enables you to keep a personal profile for a student in the Confidential area of their profile. You can view and edit previous and current profiles and add in new profiles when needed. To either edit existing profiles or add a new profile click on the cog. To edit existing profiles click on the blue Edit button and update the information as needed. You can also delete a record if needed. If you need to add a new profile then click Add. Once you have entered all the information, click Insert and this new profile will then become current and any previous profiles will be shown in the Future/Historical Profiles area. To export any profile simply click on the profile you wish to export.